Here is a case study of one of our customer, how they used Solix EDMS Test Data Management tool set to automate the creation of subsets of production databases for test and development, increasing productivity, saving money, and improving security. We recently completed an engagement with a large Public Sector customer based in Washington DC, working with an Oracle EBusiness Suite, a 16 TB database. We were able to automate the creation of data subsets for test and development and the resulting database size is 1% (180 GB to be precise) of that database while meeting the requirements of the test environment. This means we saved 99% storage and depending on the number of copies, the storage savings could be significant. If you further consider the savings in backup, and CPU use, along with associated energy and cooling, the overall savings is substantial. And smaller the dataset, faster to load, backup, and restore, and requires fewer hardware resources overall. This also improves security, as this data subset contains lesser data than fully operational database, further sensitive data has been masked by Solix EDMS Data Masking. An adequate test database must contain data that meets the needs of the selected test cases in sufficient quantity to meet the test requirements. And to test an application correctly, the test environment must match the production system as closely as possible and it must meet the needs of development, testing & training environments, each of which may have a different level of requirements. Determining how much data and what data for each environment, manually is complicated and time consuming, and IT staff lacks the time, many shops simply clone their entire production database for tests and end up creating data breach situations like what Sony is currently facing. Test Instances for other than for load testing, can work with smaller subsets. In this case, for instance, using a clone of the entire 16 TB database would create tremendous delays in testing. Just loading the full database would take significantly longer than the subset Solix created, and then each test that involved processing the data would be similarly time-consuming. And it would require essentially a full duplicate of the hardware in the production environment, starting with enough storage to hold the 16 TB database. Studies show that 60% of application development and testing time is devoted to data-related tasks that, at best, have only a peripheral relationship to the applications actually being tested. All of this time, and the extra resources required by the full database, are wasted, therefore. IT organizations looking for ways to improve productivity need to attack this problem. 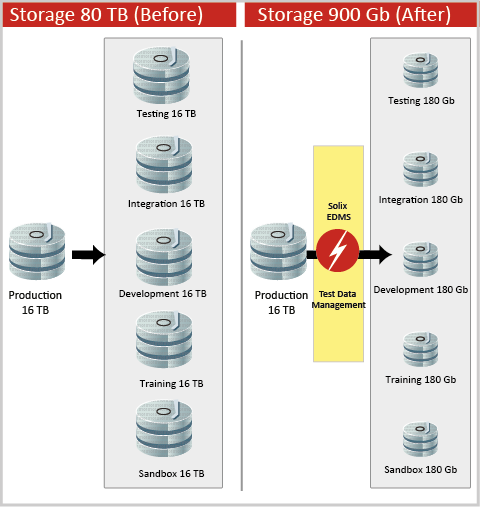 The best answer is to use an automated tool set to capture test data requirements and create a subset of the production database that meets test needs while minimizing the size of the test database. And that toolset should also allow you to mask sensitive data in the dataset, to provide the highest level of security to that data. This is exactly what the Solix EDMS tool set does. Here is a case, where one of the largest data centers with one of the most popular enterprise application is using Solix EDMS Test Data Management.